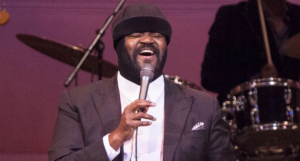 The remarkable Jazz and soul singer that is Gregory Porter has taken to wearing his trademark Sherlock Holmes-style cap whenever he makes professional appearances so fans won’t recognise him when he wants to enjoy some time away from the spotlight. He had previously revealed he initially used the fashion accessory to cover up a little skin surgery he had had on his head, but he admits having the hat as part of his look onstage helps to keep his uncovered look a secret – allowing him to enjoy family outings without being mobbed by admiring fans! We all know what that’s like!???? He does joke that the reason for wearing the cap is for when a documentary is made about him and they can call it “What lies beneath? !’ Funny man!! Naturally there are photos online of Gregory ‘uncovered’ and you certainly wouldn’t recognise him even if he shook hands with you. We’re going to pay him the respect he’s earned and not post his ‘cap-less’ pictures: One day you may be at a venue with a live band and a ‘hatless’ guy walks over, joins them for a song and you say “That guy sounds just like Gregory Porter!” Well, I’m not going to spoil that moment for you!